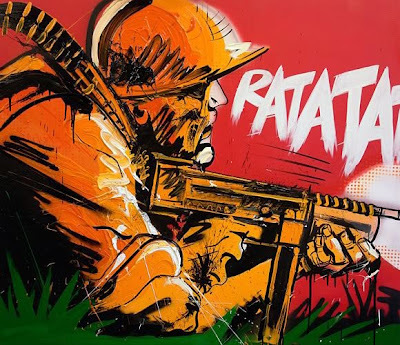 Also at the Truman Brewery as part of Frieze week is the exhibition 'Planes, Tanks and Automatics' by Dave White, again presented by Opus Gallery. Liverpool based artist Dave White draws inspiration from things he loves and has created oil paintings of sneakers, cars, animals and comic characters to date. White's first screenprint edition was released at the private view yesterday. Featuring hand-finishing and diamond dust, "Bang Bang!" will be from a signed edition of 50. Not sure if these have sold out yet, check with Opus.